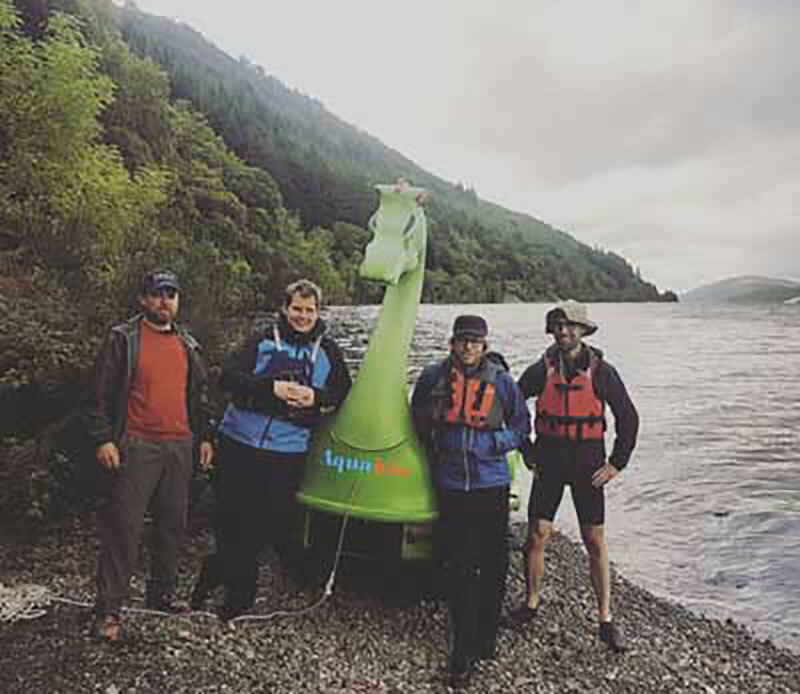 Staff at a leading water re-use company are celebrating this autumn after one of its employees pedalled a giant green plastic dragon pedalo coast to coast across Scotland from Fort William to Inverness in a bid to raise vital funds for a charity close to its heart. Matt Clixby, a Project Manager from Worcester-based Aquabio Ltd took part in the 5 man team challenge – which encompassed the full 60 mile length of the Caledonian canal through 29 locks and 5 lochs, including the full length of Loch Ness – raising an impressive £1500 for a charity that was supported by his friend, Mike Hall, who passed away earlier this year in a cycle accident whilst racing in Australia. Matt explained : “Not only was Mike a good friend of mine, he was also arguably the world’s best amateur endurance cyclist. As a keen cyclist myself, I was devastated when I heard that he had died in an accident in Australia on 31 March and decided to not only challenge myself but give something back to the charity he so loved. “The idea originally came about when – after a few ales with Mike in a pub – we decided to explore the idea of buying a pedalo and pedalling it somewhere ridiculous. This led to an online hunt for a vessel, resulting in the purchase of a secondhand dragon pedalo moored at Warwick Castle. The charity – Newborns Vietnam – works towards saving lives by reducing neonatal mortality and promoting the health of newborn children and their mothers in South East Asia with a specific focus on Vietnam. The latest data shows Asia Pacific regional neonatal mortality at 9 deaths out of 1000 live births, whilst Vietnam’s rate is 12 out of 1000. In 2015, neonatal mortality accounted for three quarters of all infant deaths in Vietnam and more than half of mortality in under 5s. Employees at Aquabio have a keen interest in cycling; by the end of September, they had collectively ridden 31,638 km, raising £790.95 for cycling charity Sustrans. The aim is to cycle a distance equivalent to the circumference of the planet by the end of the year. For further information please contact Matt Clixby, Project Manager, Aquabio Ltd on 01905 642611 or matt.clixby@freudenberg-filter.com. This entry was posted in Health, Charity, Social Responsibility. Bookmark the permalink.